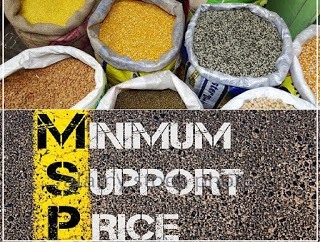 Minimum Support Price (MSP) is the price fixed by the Government of India for some of the listed agricultural crops in the market. It is a kind of market intervention to insure the farmers against any sharp fall in crop prices during bumper crop production. Minimum Support Prices are announced by the Cabinet Committee of Economic Affairs, Government of India at the beginning of the sowing season (Rabi and Kharif) for certain crops on the basis of the recommendations of the Commission for Agricultural Costs and Prices (CACP). Minimum Support Prices act as guaranteed prices for the farmer’s produce along with their long-term investment decision in the actual market. The main aim of this market intervention i.e MSP, is to support the farmers from distress sales and to procure food grains for public distribution. Whenever, the market price for the commodity falls below the announced Minimum Support Price due to bumper production, thereby making a glut in the market, the government agencies such as FCI and Nafed, purchase the whole lot from the farmers at the announced minimum support price. Macro-economic variables such as general level of prices, consumer price indices and those reflecting monetary and fiscal factors. The Commission identifies the main issues of relevance for the ensuing season (short, medium or long turn). The Commission sends a questionnaire to Central Ministries, State Governments and other organizations related to trade, industry, processors, and farmers both in the cooperative and the private sector and seeks their views on certain issues and factual information on related variables. Subsequent to step (ii), the Commission holds separate discussions with the State Governments, Central Ministries/Departments and other organizations. The Commission also interacts with research and academic institutions and keeps track of relevant studies and their findings. The Commission visits certain areas for on-the-spot observations and feedback from local level organizations and farmers.